Lucille Ball plays hostess at the Grand Ole Opry in Nashville. 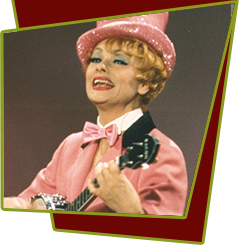 The first comedy skits includes Lucy leading unruly members of the Nashville Philharmonic in "Tennessee Waltz" as the replacement conductor. The other main comedy bits include Lucille as the bitter loser in a music contest and a duel of saxophones as Barbara Mandrell and Lucy struggle through Lucille's rendition of "Glow Worm". Special Notes: The Nashville Philharmonic bit comes from The Lucy Show episode #43, "Lucy Conducts the Symphony".